Venice Shipping and Logistics S.p.A.
Born in Naples in 1964, Fabrizio graduated in Economics & Finance at the “Università Federico II di Napoli” with the highest grade. He started working in 1984 for BNL (Banca Nazionale del Lavoro). During his career he had important guide roles in other three Merchant Banks (in the last one he was CEO). In 2000 Fabrizio joined Efibanca, the Investment Banking arm of Banco Popolare Group specialized in Shipping Finance, where he assumed the role of Head of Advisory – M&A Division in Milan. He was involved in several and important Private Equity Joint Ventures between Efibanca and Shipping Companies such as Moby S.p.A., Onorato Family in Ro-Pax Ferries, Gestao de Nevegaçao Lda, Premuda Group in the Tanker Sector, Aurora Shipping S.p.A. and Giuseppe D’Amato Family in the bulk Sector, Italia Marittima SpA acquisition by Evergreen Marine Group in container sector. Furthermore He was hired as Business and Financial Advisor to set up most relevant Shipping Business Combinations. 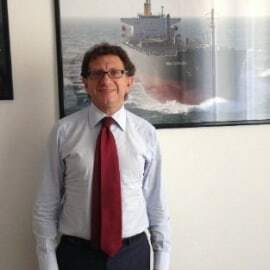 He’s been engaged in Shipping Industry for the last 20 years and, throughout his career, he has established excellent relationships with most Italian ship-owners and some key international shipping players. Fabrizio is a Board member of CONFITARMA (Italian Ship owner Association), and also Vice President of the Fiscal & Financial Commission. In 2009 he founded a new Private Equity and Advisory Company (Venice Shipping and Logistics – VSL) targeted on Shipping Industry sponsored by Institutional Investors and relevant Shipping names: Venice Shipping and Logistics S.p.A., where he assumed the role of Managing Director. VSL currently is sole Italian player active in Shipping Finance and Investment sector, engaged in most of restructuring and reorganization plans, as well he was involved in Terminal and Port Infrastruture projects, among else: the acquisition of minority stake by VEI Capital respectively in Turkish GPH and Italian Mar Ter-Neri Group. He was appointed as hearing member of GPH BoD and ordinary Board Member of Mar Ter-Neri Group.